Now things are getting exciting. With just eight days to go until the official launch evening you probably imagine that I am sitting at home with my feet up, chilling before the big event. Not a bit of it. There is still lots of work to do and over the next week I will post daily blogs of the run up to the launch itself. Yesterday was quite chilled though, we spent the day over in the Kendal area mainly to distribute posters of the launch weekend into local hostelries and establishments. It would be nice to think that the Saturday and Sunday will be busy at the venue with people dropping in to collect or buy copies of the book but I am a realist. Even though the response has been good to the event on Facebook here I do realise that I need to do the groundwork to get people to attend the event. Big publishing houses run these sort of activities all the time and have a big budget to sell books but not me, this has all been done off my own bat so footwork has to be done. I am fortunate that so many press and media organisations have picked up on my story and I am grateful to their publicity but in my heart I am still concerned that people will not turn up in numbers. At least we have given it our best shot. The advantage about getting out there and meeting people yesterday it may result in me giving talks at two other venues in the future, more information when I have it. In the meantime, today has been the day for organising the limited edition prints ready for posting out or collecting from the event. 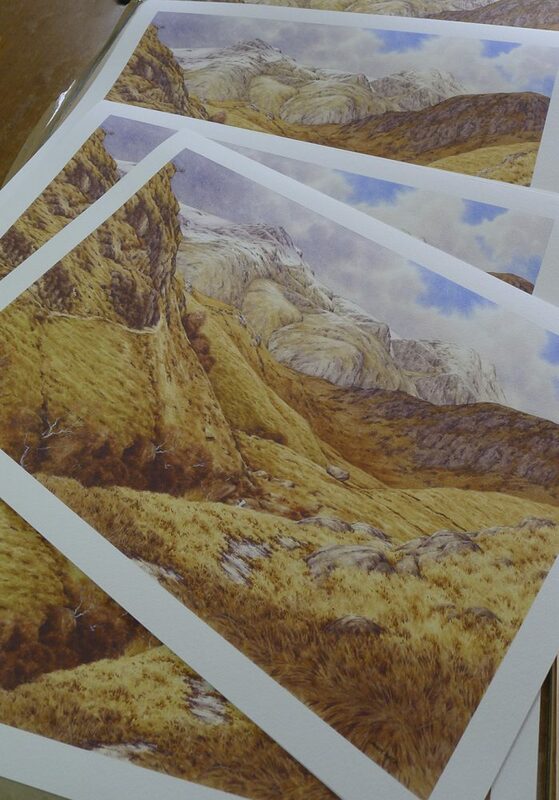 These prints, both the Scafell Pike prints shown here (off the front cover of the book) and the Innominate Tarn print are the only two prints from the whole of The Wainwrights in Colour project and as the are both in an edition of 214 they are proving to be quite popular, especially as they sold with the matching number of the book. More information is available here. If anyone has already order just a copy of the book and would like to upgrade to this package then they can just email me. Over the next few days I will be framing up some of these prints, some of which are for customers to collect whilst others will be on show at the launch event and available for sale but of course in limited numbers. This is the first time that they will have been on public display. So it’s back to the framing for me, lets see what tomorrow brings on The Wainwrights in Colour countdown.